TransITech 09 in Toronto. TransITech is the biggest technology conference for the transit industry in North America. I remember attending it last year when I just started working on the Google Transit partner program and had just celebrated my son's first birthday. Looking back, I am amazed by how much Google Transit, the industry, and my son have grown and accomplished in just 12 short months. Here are some highlights for Google Transit (but I'll resist the urge to brag about my son). In one year, the total number of cities for which people can plan transit trips with Google Maps has grown to more than 250 -- 500% more than last year. In North America, we've grown from supporting around 20 agencies to 115 agencies, including 8 agencies in Canada. These agencies range from serving large metropolitan areas like Atlanta, Montreal and New York City to rural areas such as Humboldt County, California. In South America, we had agencies in São Paolo and Belo Horizonte join shortly after Google Maps launched in Brazil. Many European agencies have been added across 8 countries, covering cities such as Moscow, Bordeaux, and Lisbon, and we even added national coverage for Austria. Last year, the big news for our Asian coverage was the nationwide launch in Japan and our initial launch in China with fewer than 20 cities. Today Chinese users can plan transit trips in 82 cities including Beijing and Shanghai. Perth was the first agency to launch in Australia, recently followed by Adelaide. And once you hit the road, you were out of luck - a year ago, you could only plan transit trips on a PC. Today you can plan your transit trips on the go by using Google Maps for mobile on a wide range of mobile devices, including iPhone and Blackberry. Finally, the Transit Layer is the newest feature in the transit family, helping you easily discover public transit routes, with a total of 60 cities included . 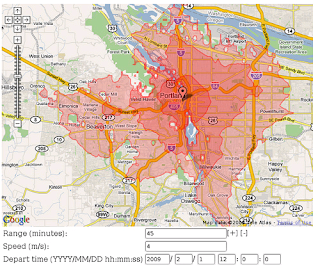 Unibus-iBus Universal: an iPhone application that estimates bus arrival time. It started with TriMet’s information, and then quickly extended to 15 additional cities with GTFS data. iBART: an iPhone application similar to iBus but specific for BART service in the San Francisco Bay Area. It was created by two college students, Ian Leighton and David Hodge, and was launched on the App Store just days after the app store was launched. Graphserver: an open source trip planner developed by Brandon Martin-Anderson. It is the backbone for any application requiring a routing engine. An interesting application using Graphserver is TransitShed (first announced on Transit Developer Group on Feb 10, 2009) which shows how far a person can go using public transit. Just nine days later, Brian Ferris further developed it by mashing up TransitShed with Yelp reviews to enable users to find businesses within the reach of public transit. Seeing this sort of collaboration - developers building on the work of other developers using open data - is really exciting for us to see. TriMet, the first agency to publish its GTFS feed, launched developer resources to support developers using its GTFS feed and Transit Tracker Real-time Web Service. About 30 applications have been developed already. Transit agencies would not have the resources to develop these applications themselves (at least, not at the speed external developers can). By publishing transit information, agencies leverage developers' talent to encourage transit usage. These applications help provide more information that promotes the availability and convenience of public transit -- and make it fun. After stepping down from the podium at TransITech, I couldn’t help but feeling proud to be part of such a wonderful accomplishment. And Google couldn’t have done it without the support of great transit agencies and enthusiastic developers. I can’t wait to see how far we've all come next year. My colleague Naomi and I recently presented at APTA TransITech 09 in Toronto. TransITech is the biggest technology conference for the transit industry in North America. I remember attending it last year when I just started working on the Google Transit partner program and had just celebrated my son's first birthday. Looking back, I am amazed by how much Google Transit, the industry, and my son have grown and accomplished in just 12 short months. Here are some highlights for Google Transit (but I'll resist the urge to brag about my son).